At Boku Slots we love games with a classic feel, which is why we’re happy to introduce you to Cash Stax. This title is brought to you by the creative team at BarCrest, a name you may recognise from playing slots in the pub or at a beachside arcade. Cash Stax has an attractive yet simple and traditional design. With an RTP that can increase, it makes for an interesting twist on the traditional noughts and crosses theme for its players. 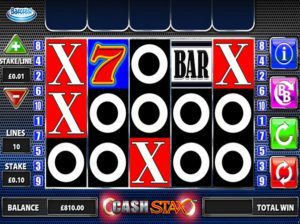 Cash Stax is a slot game played across five reels and it has pay lines that increase the more you stake. Your basic pay lines are 10, but can be increased to 20 and even 30. Couple this with an RTP that increases from 94.12% for the normal game, up to 98.14% during the Big Bet games and you are in for a wild ride. Big Bet game offers the chance to play with 30 pay lines. Symbols – As mentioned previously, you will see that the design is related to noughts and crosses. The other reel symbols include Red 7’S, Bars, X’s, a Jester (your wild) and the golden rings which trigger your feature. Wild Symbol – This is an exciting symbol to land, as it can be substituted for any other symbol except the golden ring. So, if you are in need of a winning pay line combo and this lands you are good to go. In Cash Stax the jester can also appear on stacked reels, meaning it can help complete multiple pay lines. Scatter Symbol – The golden ring is your scatter symbol and if it lands, it also triggers the bonus spin feature. All you need to do is land 5 golden rings to activate the bonus spins. Big Bet – There are two Big Bet options to play with on Cash Stax, £10 or £20. You will be allocated 5 spins for your big bet choice and will be playing with the maximum 30 pay lines. On top of that you have the chance of a maximum win of 75x your stake amount. If you activate the bonus spin feature during the Big Bet spins, you are looking at up to 375x the stake amount as a result of the amazing 5x multiplier. Bonus Spin Feature – To trigger this spins feature you need to have 5 golden rings, at least one on each of the reels. If you get the minimum 5 rings across the reels then you will enter the bonus spin mode, with each ring allocating you 1 extra spin. If you fill up the spin ladder at the side of the screen during the feature, then you will trigger the 5x multiplier which will be added to any remaining bonus spins during the featured play. 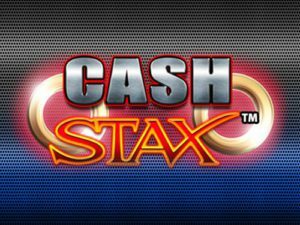 If you love easy to play games, with basic but exciting features then Cash Stax is the game for you. We love the fact that the golden rings drop quite often on the reels, making the chance of hitting the bonus spins feature more achievable. It has the distinctive BarCrest themes throughout and is brightly coloured making it easy on the eye and great for playing across all platforms including mobiles and tablets.